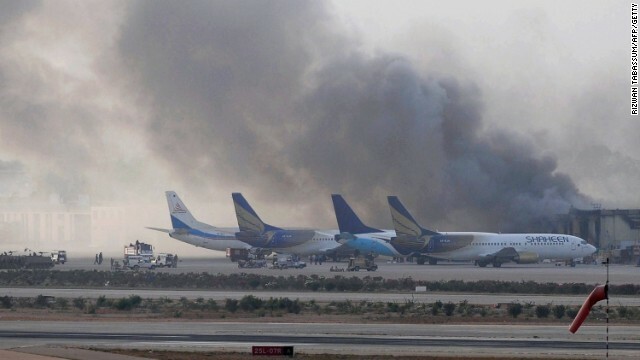 Smoke rises after militants launched an early morning assault at Jinnah International Airport in Karachi, Pakistan. Las Vegas police search for answers after two cops and a shopper are gunned down. The release of a U.S. soldier generates more controversy. And prisoners at a Canadian jail stage a Hollywood-style escape. Shooting targets cops: A married couple yelled "revolution" before gunning down two Las Vegas police officers at a pizza restaurant yesterday. After doing that, they then ran across the parking lot to a Walmart, where they killed a shopper. The duo's shooting rampage ended when the wife fatally shot the husband and then herself as police closed in. More details are expected at a news conference in a few hours. Hours of chaos: The Pakistani Taliban claimed responsibility for an attack last night at the country's largest and busiest airport. Twenty-eight people died in the fighting. The Taliban said the assault was in retaliation for a U.S. drone strike in November that killed former chief Hakimullah Mehsud. Filling in the blanks: There were lots of new details over the weekend on the release of U.S. Army Sgt. Bowe Bergdahl. The Taliban kept him in a dark box for weeks after an escape attempt, a U.S. official said. Bergdahl, who was held for five years, is recovering at a U.S. military hospital in Germany. This week, the Obama administration will continue to brief members of Congress on the negotiations that led to his release. Many lawmakers don't like the way things were handled. Getting better: Tracy Morgan is still in critical condition but showing signs of improvement after a weekend car crash along the New Jersey turnpike. The comedian suffered multiple injuries, including broken ribs, a broken nose and a broken leg when a semitrailer hit his limo van. The accident killed fellow comedian Jimmy Mack and injured several other people who were traveling with him. The driver of the truck faces criminal charges. Flight time: We've seen this before, but it's always a bit of a surprise. Three men escaped from a Canadian jail by helicopter over the weekend. The chopper swooped into the courtyard, picked up the prisoners and flew off into the night sky. A manhunt is underway. - Early Father's Day surprise: Ronald McDonald House Charities in Canada and WestJet reunite Marc Grimard with his sick child and family. Grab a hanky before hitting play. - New toy: Leave a French bulldog puppy alone with a springy door stopper, and this is what you get. - First day on the job: Not too hard to believe, but why were his co-workers standing by to record this epic fail? - Baby got orchestra: Unlike chocolate and peanut butter, some things just don't belong together. Take Sir Mix-a-Lot and a symphony. You be the judge. - Bambi gets stuck: Enjoy this tender moment as a young deer is freed from a fence as Mama watches nearby.